We love the idea of a 'test kitchen.' A place where elements come together. A 'test' kitchen conjures up the notion of fresh ingredients, new ideas, a bit of bravery, and loads of experimentation. Careful preparation with a dash of theater thrown in. Then there is the eating, arguably the most satisfying part. 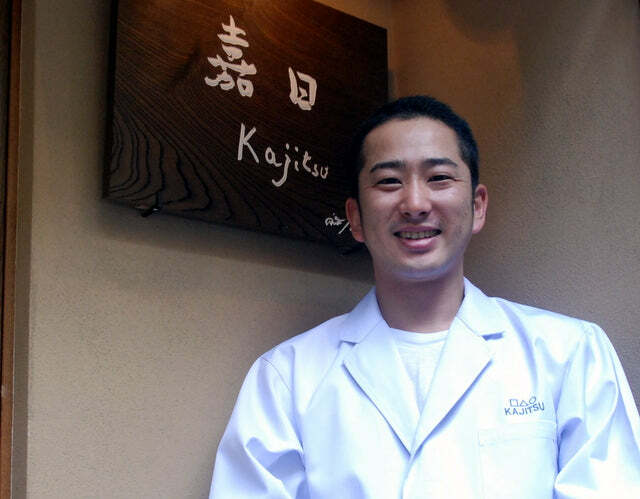 Nishihara-san is the inspiration and master chef of Kajistu the michelin star awarded restaurant in New York. Here's a recent review on his NY restaurant in the NYTimes. Nishihara-san does amazing things with vegetables. From his seasonal selections, interesting discoveres, extraordinary combinations, preparation and final presentation, each item is a masterful creation. Nishihara-san with the assistance of Harris Salat, hosted a Japanese cooking workshop in Saveur's test kitchen in New York two weeks ago. From Soba noodles and dipping sauces, the journey proceeded from there. Harris writes well of his evening in Scenes from a Japanese Cooking Workshop. We were delighted to be invited to join this special event. 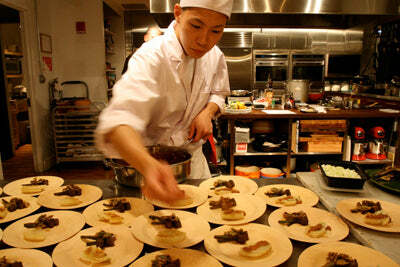 The entire evening's fare was presented on bambu products. 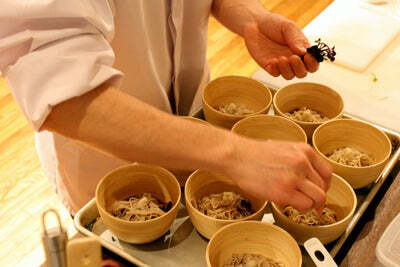 Soba noodles served in our Naked hand-coiled Lacquerware bowls. 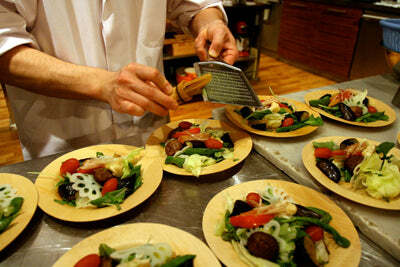 Fresh vegetable salad on our All Occasion Veneerware® and the implements of choice? Naturally, bambu Snapstix® - our version of the chopstick. Harris Salat is an admired talent in his own right. Writer, cookbook author, student and teacher of Japanese culture, we have been exchanging insights back and forth about Japanese authors, favorite foods, master bamboo basket weavers, and favorite places in Kyoto. Read his Japanese Food Report for an inside look and genuine appreciation for the food (and culture) of Japan. Thank you Nishihara-san, and Harris. You have thrown a masterful event. Plan to see you in February.